I feel so sick that Abi has gone. I just can’t believe it. How can she not be here? There is such a huge void without her presence. When buying cakes at a sale today, I chose four. Now, I would normally do that because I wouldn’t usually have one (watching my weight). But I looked down at the four and realised that I’d be able to have one this time… I just wanted to break down. 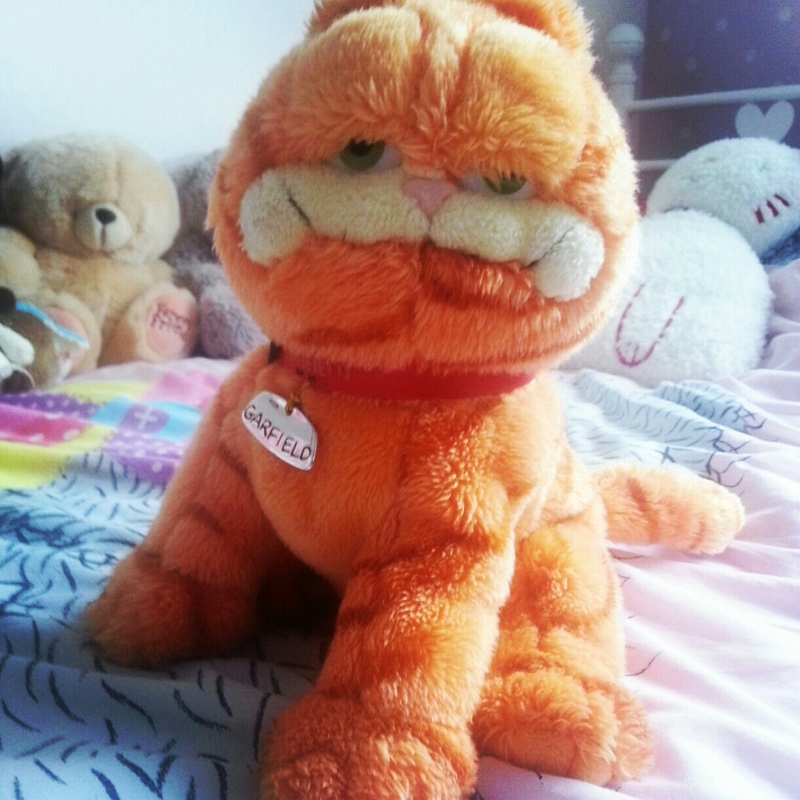 This is Garfield. It’s not just any old cuddly toy; this guy has travelled miles for us, in more ways than one! When in Menorca, our first holiday abroad as a family a few years ago, my middle daughter spotted Garfield in the local toy shop. She wasn’t a particularly big fan of Garfield, but the bright-orange cat with his cheeky face really stood out to her. He was quite expensive as a treat so we didn’t buy him on first sight. It wasn’t until the end of the holiday that we remembered the cat and she bought it with her remaining spending money. He was worth the money, as he’s beautifully made and looks as good as new today. I’d like to close the account please… because she’s dead! Having Abi’s death well-publicised thanks to the wonders of Facebook and local media coverage has really helped me to avoid the anguish of telling people face to face. To speak those words is extremely hard, even now, although I’ve been talking about what happened to her so much that it’s almost become an automatic message playing over in my mind. Then something happens that rocks the already rocky boat… It’s the practical aspects of existing that are hard to confront, but they must be done. As her mum, I have to ‘undo’ the admin side of Abi’s life. Imagine an average day without someone you love dearly, a child, spouse or close relative you live with – knowing that you’ll never see them again. It’s almost impossible to do, unless you’ve experienced it – I know this now. I could empathise with the anguish, the hurt, but actual continuing grief goes so much deeper and affects all aspects of life, from the mundane routine things to the complete outlook on life and faith. Can exercise bring out your emotions? I’m running Bristol 10k for the Wallace & Gromit’s Grand Appeal in memory of Abi. For various reasons, I’ve not run since November last year, so while in my mind I could ‘easily’ run a 10k, having run a few in 2012, my body needs some reminding! There’s 8 weeks till the run, so I should be up to speed by then if I take it slow and steady. When this happened to Abi, things that had been important to me day-to-day fell into insignificance. I felt that I would never want to run again, and certainly never work again. As time has passed, my attitude has changed, and I’m very relieved about that. Abi loved me being ‘fit’, like her. I would say she even nagged me when I missed a class or a run. It was our mutal interest. I could almost hear her talking to me, saying ‘get up and run, Mum’. As I sit on Abi’s bed, I know it will never be slept in again. The Olympic duvet cover we chose together last summer, the pillow and the sheets, all smell of her. Despite aching to be close to her again, I cannot lie down. I lean over and put my face into her pillow. The smell fills my nostrils like nothing else. I recall that newborn head smell, the pang in my heart, my maternal instinct kicking in as I breathed in her smell for the first time. This feeling is the same, but, as well as maternal pangs, I feel a sharp pain deep in my chest and a ‘winded’ sensation in my lungs. I instinctively exhale an audible groan in response.